Window Barking – How Bad is that Barking in the Window? One of the most common questions I am asked about dog behavior is, “What can I do about window barking?” Some may not like my answer but read on. Window barking is not a productive pastime and it’s something my dogs don’t do or as I say, “it’s not on their daily to do list”. Now, before you think that my poor dogs live a deprived life unable to look outside, I must tell you most days my dogs are too busy, tired, or being calm/relaxed to even think about barking out the window. We also spend a great deal of time outside interacting with, versus watching, the outside world. They are active participants. I work hard to manage their time with more appropriate and stimulating behaviors throughout the day that use their mind, body, and nose. At best, window barking is an annoying, inappropriate pastime. At worst, it can transfer over to other areas of a dog’s life, because in their mind, it “works”! Think about it – a dog passes your home, your dog barks, and the other dog goes away! Or better yet, how about the scary man that comes daily carrying a bag and making noise on your front porch? That’s right – the mailman. Your dog barks, the mailman goes away. As humans we know he wasn’t staying, but your dog doesn’t. When he barks and the mailman leaves, the barking behavior is actually reinforced. This also teaches the dog how to deal with scary things or things he’s unsure of in his world – bark and they go away! From my experience, window barking also can lead to leash reactivity and even more aggressive displays of behavior as the dog becomes frustrated and aroused every time they see a human or dog and can’t get to them. When dogs are behind a barrier, like a window, and they can’t get to something, whether it be the mailman or another dog, it can arouse or frustrate them. Often seeing something on the sidewalk may start out as just excitement and arousal, but can increase in frequency and intensity. Many dogs do this daily and some multiple times a day. Just like humans, the more a dog does a behavior, the stronger the pathway to the brain for that behavior, and the more a habit is formed. Think about humans and cigarette smoking. The longer a human smokes, the harder the habit is to break. Habits in dogs are no different. Once a habit is formed it is hard to break, and you do not want window barking as one of your dog’s habits! Also, barking and over-arousal at the mere sight or dogs or humans can keep the dog in a constant state of arousal. This is bad from both a behavior and a health standpoint as it can add stress to your dog’s life. So how do you handle window barking? First, if possible don’t let it start! Keep in mind creating those pathways to the brain for behaviors and how we get better at behaviors we repeat or do frequently. Make sure this behavior is not on your dog’s “to do” list…EVER! 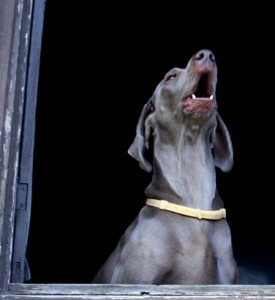 If window barking is already a habit, how can you train your dog to give it up? Block the view. The first step in any behavior modification program is to set your dog up for success by managing the environment. Put a baby gate over areas with windows and passers by. Use a crate when you can’t be there to manage your dog’s environment. Block your dog’s view by closing the blinds or putting decorative window film on the lower part of the window that can still let in light. Attractive film can be purchased at any hardware store. Replace window barking with more enriching pastimes. Keep your dog busy through more appropriate daily activities. Dogs need exercise, mental stimulation like food toys or frozen Kongs, and hunting games. By keeping your dog busy with healthy alternatives, he won’t have the time or desire to use his energy in inappropriate ways like window barking. Ignore the behavior. That’s right: many dogs get a LOT of human attention for barking. Often, when the dog starts barking, their human joins in and barks along with them by yelling “NO!”. Your dog just thinks you are in on the fun and drama, and it only increases the arousal! Also, studies show that just yelling “no” at your dog can increase anxiety and aggression by 15%! ** It’s adding fuel to the fire! When your dog barks, try ignoring your dog, or even leaving the room immediately. Without an audience, some dogs will stop barking on their own. dog. Training your dog basic behaviors occupies his mind, helps him look to you for direction, and provides a healthy outlet for his energy. Also, once you’ve trained an excellent recall/come, you can use it to call your dog away from the window. Many people skip the little steps in a dog’s life like training “sit” and “come”. I call these behaviors “elementary school behaviors”. If we can’t get our dog to sit, come, and exhibit basic manners in everyday life, how will we ever be able to manage our dog’s behavior when he’s aroused and barking at the window? In other words, we have to complete elementary school learning before we can move on to high school learning like not barking. Learning the basics sets the tone for learning other, more advanced behaviors. Teach your dog the “Quiet” cue. First teach your dog to bark on cue. That’s right – teach your dog to bark! We are going to put the behavior on cue so you can control it. Give your dog the cue to “speak”. Let him bark 3 times and then pop a wonderful treat in front of him as you say “quiet”. Practice this in a quiet area with no distractions. Once your dog is doing well with this new cue, then gradually add distractions like the doorbell, a knock and/or visitor. Once the dog is doing well, I also like to add some distance and another cue between the bark and “quiet” by walking into another room and asking the dog to do a behavior like sit. This will help prevent you from teaching a behavior “chain” of “I bark, I’m quiet, I get treat”.